Happening, installation and object series. 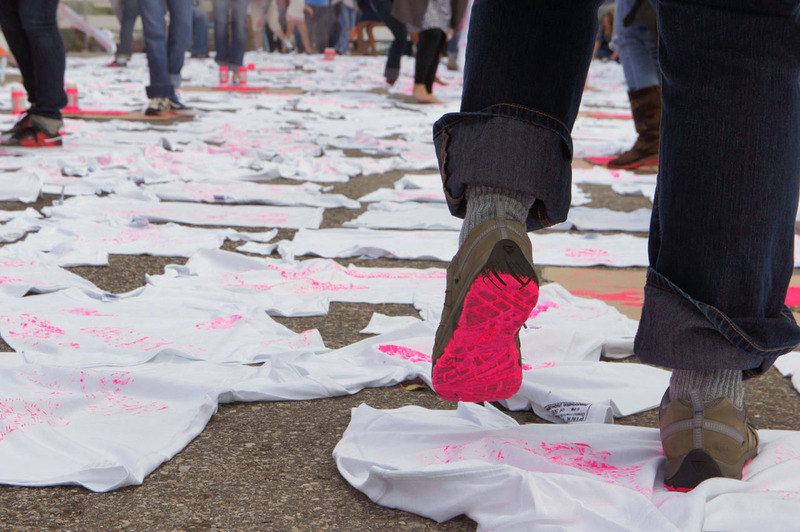 White t-shirts, pink-fluorescent acrylics, shoes and clotheslines. 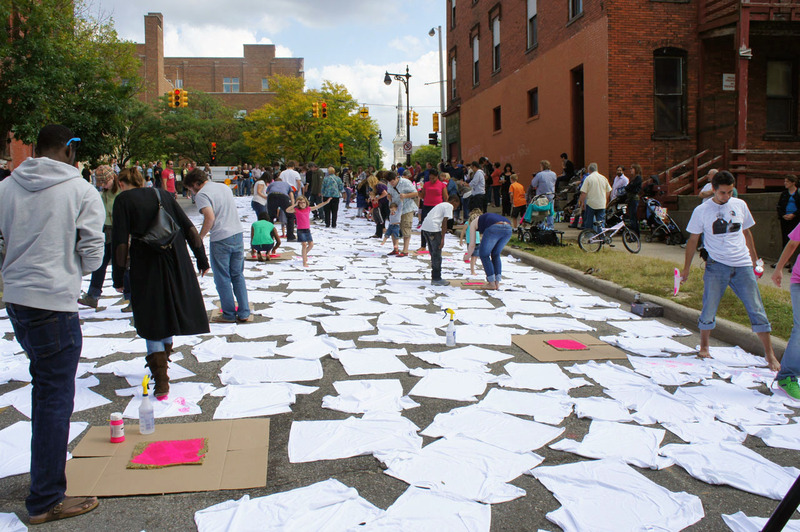 Hundreds of white t-shirts are on the street. 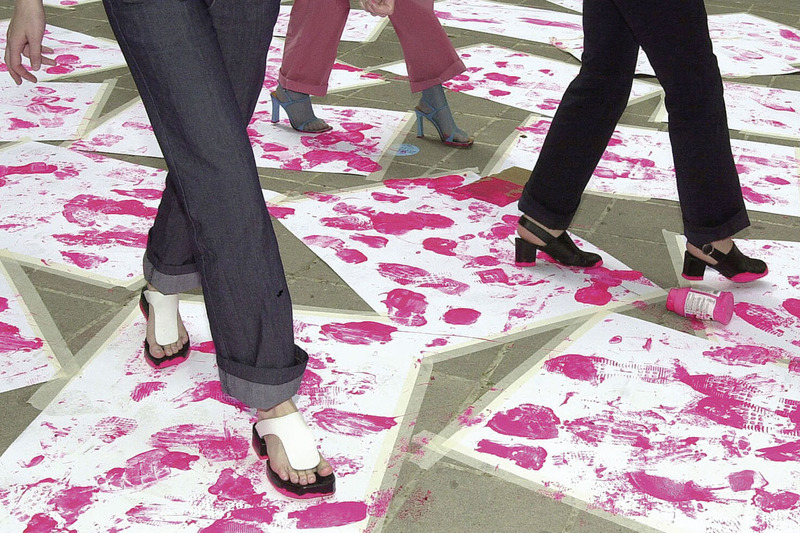 The participants slip into the shoes provided, step into the acrylic paint and run all over the clothing. 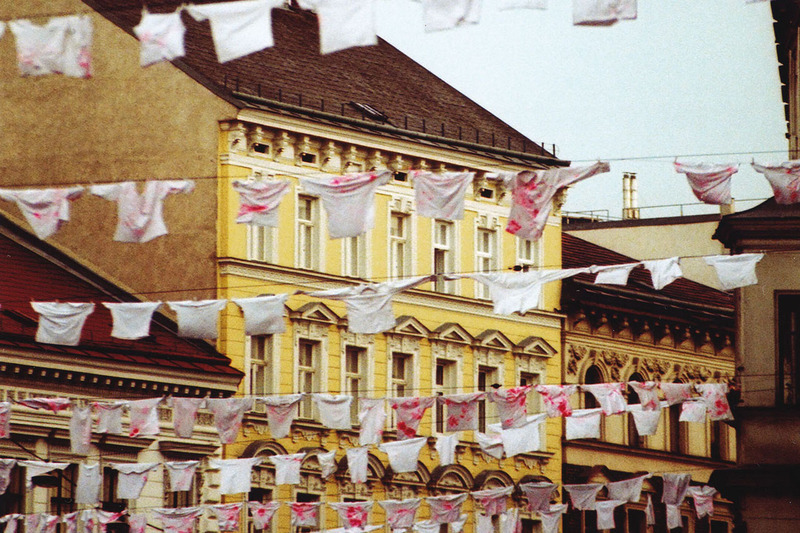 They leave their traces on the shirts, which are then hung up to dry. 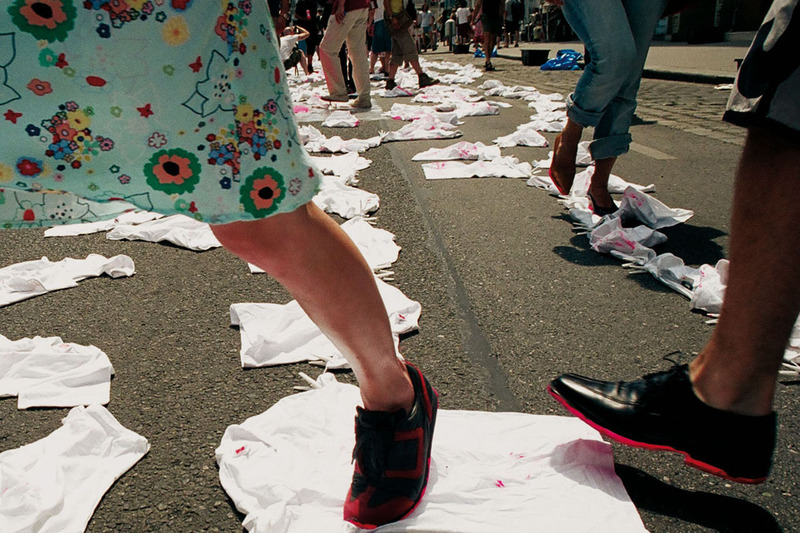 Once dry, the shirts are sold and worn as clothing; what were once many traces on the ground disperse in all directions. 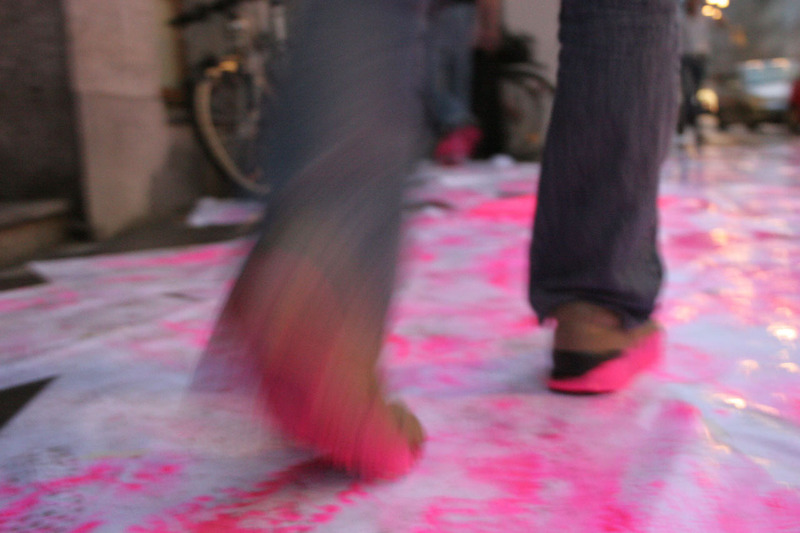 Pink Prints – street wear is the materialization of the sole’s fleeting contact with the ground: the concurrence of street, steps, clothing, dirt and paint. 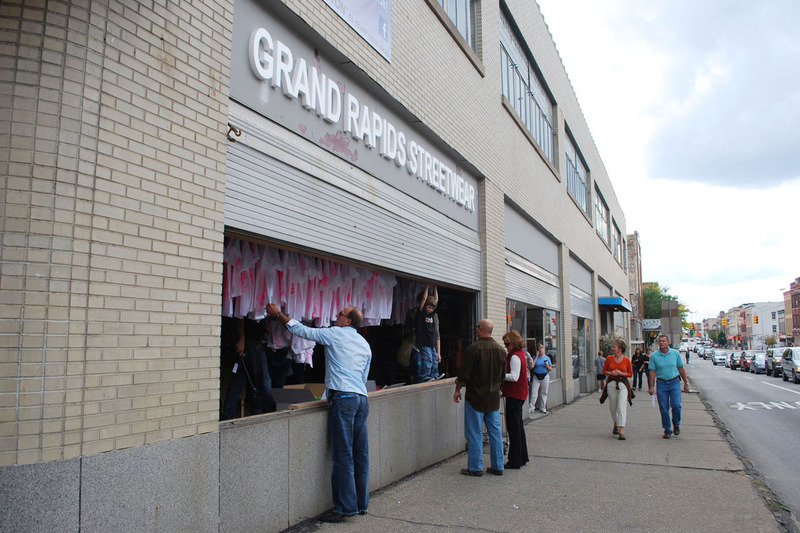 Pink Prints – Grand Rapids Streetwear. Happening, Installation and Objects. Group exhibition “ArtPrize”. Venue: Site:Lab + U of M School of Art & Design, Fulton / Division, Grand Rapids, MI (USA). Fulton / Division, Grand Rapids, MI (USA). Photo: Juliet Hinley. Weston St SE, Grand Rapids (USA). Video: Assocreation. 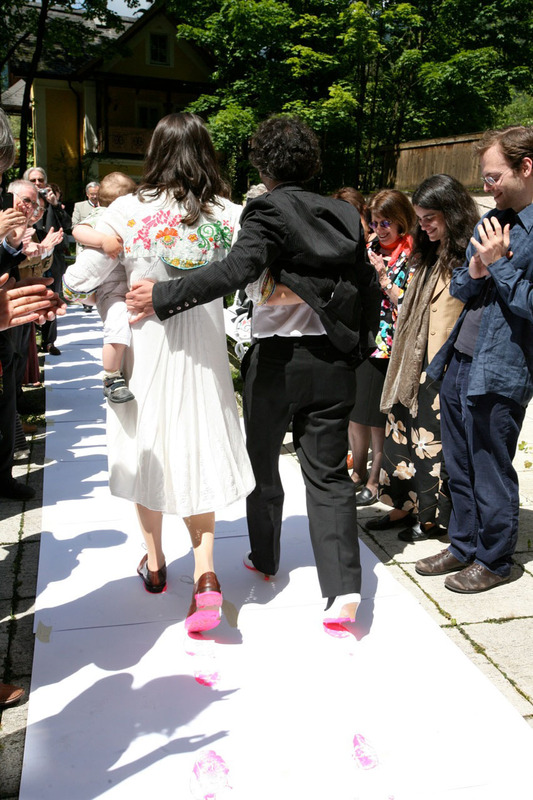 Pink Prints – first steps. Happening and object. Bad Ischl (AT). Bad Ischl (AT). Photo: Assocreation. Pink Prints. Object. Group exhibition “Cim Nekül”. The Wenzl Collection. Institut Français, Budapest (HU). 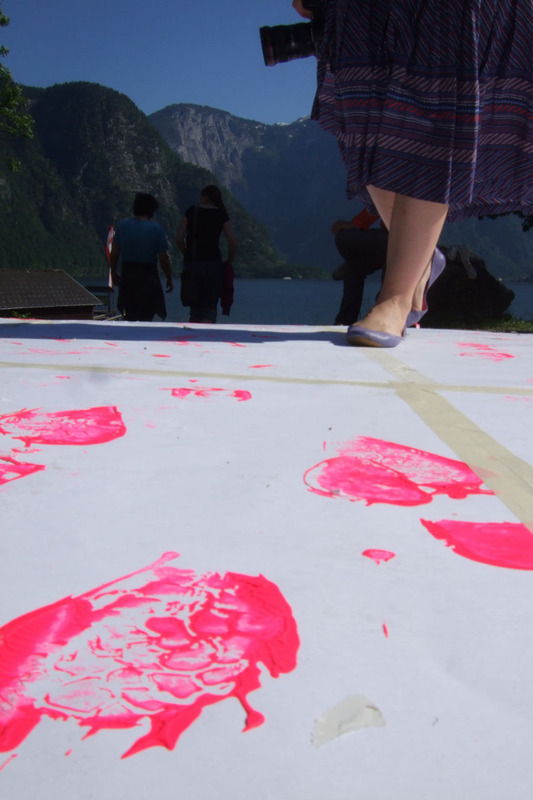 Pink Prints – picnic. Happening. werkzeug H, Vienna (AT). werkzeug H, Vienna (AT). Photo: Assocreation. 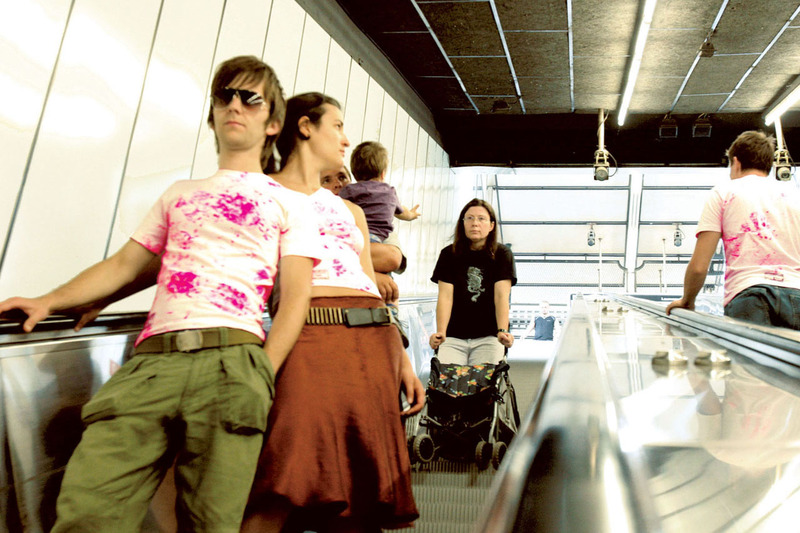 Pink Prints – street wear. 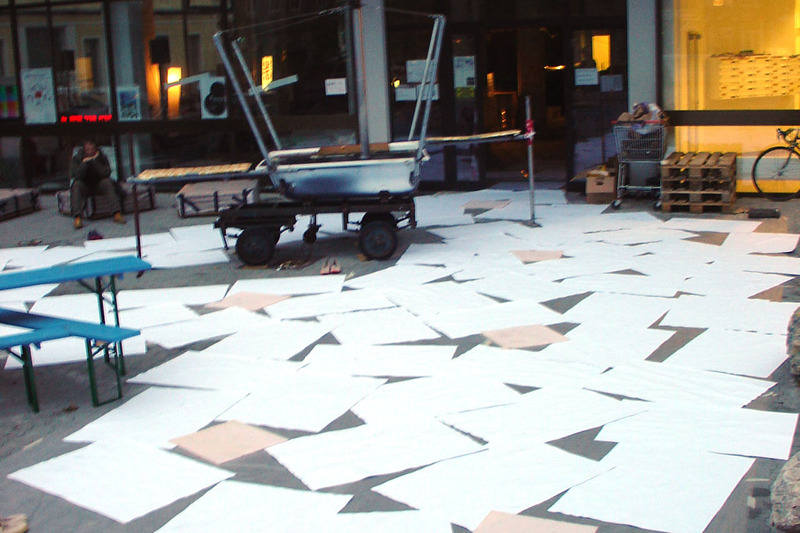 Happening and installation. Schönbrunner Straße, Vienna (AT). Schönbrunner Straße, Vienna (AT). Photo: Klaus Pichler. Pink Prints – street wear. Objects. Kunsthalle-Wien shop, Museum Moderner Kunst Wien shop, Museum für Angewandte Kunst Wien shop and several fashion shops, Vienna (AT). Schwedenplatz, Vienna (AT). Photo: Assocreation. 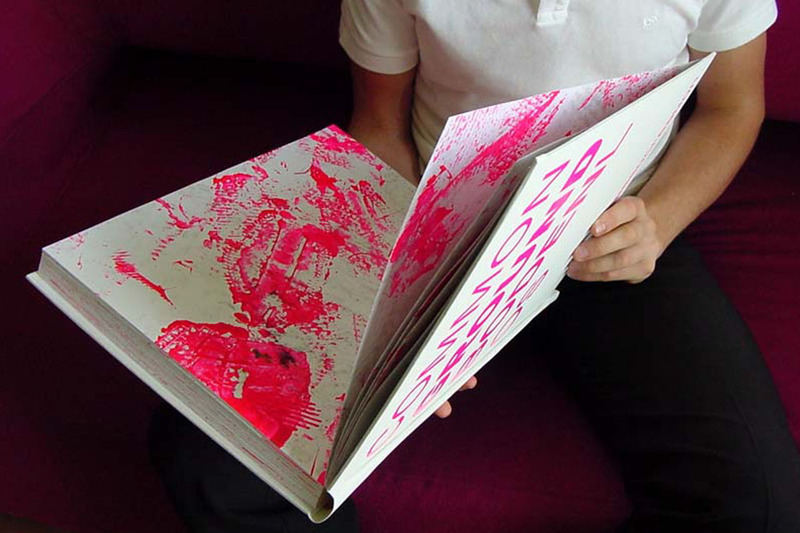 Pink Prints – final report. Happening and object. Group exhibition “theendishere”, Galerie Framework, Schönbrunner Straße, Vienna (AT). Schönbrunner Straße, Vienna (AT). Photo: Assocreation. Galerie Framework, Schönbrunner Straße, Vienna (AT). Photo: Assocreation. 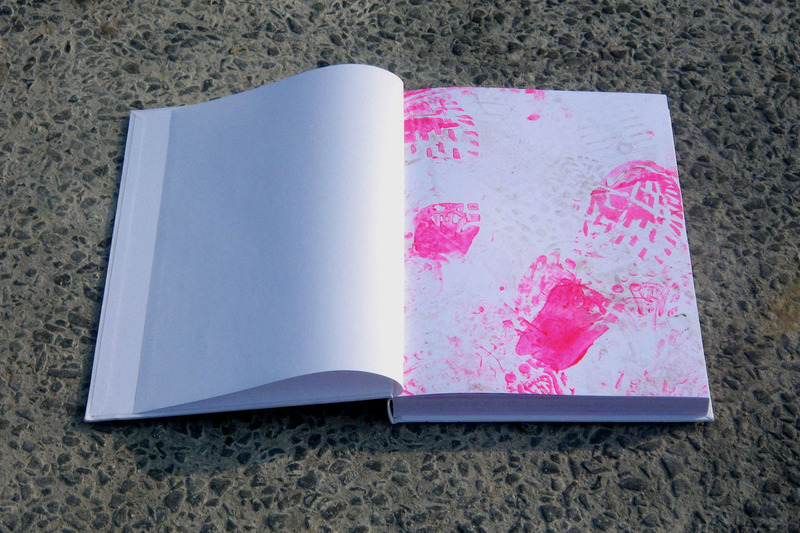 Pink Prints – shoe diploma. Performance and object. Künstlerhaus and Österreichische Nationalbibliothek, Vienna (AT). Künstlerhaus, Vienna (AT). Photo: Clemens Fabry. Österreichische Nationalbibliothek, Vienna (AT). Photo: Assocreation. Künstlerhaus, Vienna (AT). Video: Assocreation.